HRMM is open 7 days a week, 11 am to 5 pm, April 21st, 2018 through November 18, 2018. Wondering about the weather? Hudson Valley Weather has accurate, up-do-date, local weather for the entire Hudson Valley. The Museum offers discount admission days on special holidays. Discount admission is $2 off each admission level or $5 off the Family Rate. Check our calendar for special discount days. Route 9W from the North (Kingston-Rhinecliff Bridge) Take the first exit after the bridge. Turn left at the end of the ramp onto Rt. 32, following Rt. 32 South until it intersects with Rt. 9W (traffic lights). Turn left onto Rt. 9W South, following to the second traffic light. Turn right onto Garraghan Drive at the traffic light. At the next traffic light (Broadway) turn left, follow to the bottom of the hill. Bear left. The museum will be on your right. Look for the grey and dark green Kingston Home Port and Education Center and the 1898 black and red steam tug Mathilda dry-docked within the museum courtyard along the Rondout Creek. The museum is the two story brick building adjacent to the courtyard and the entrance is through the museum gift shop on the street side of the building. 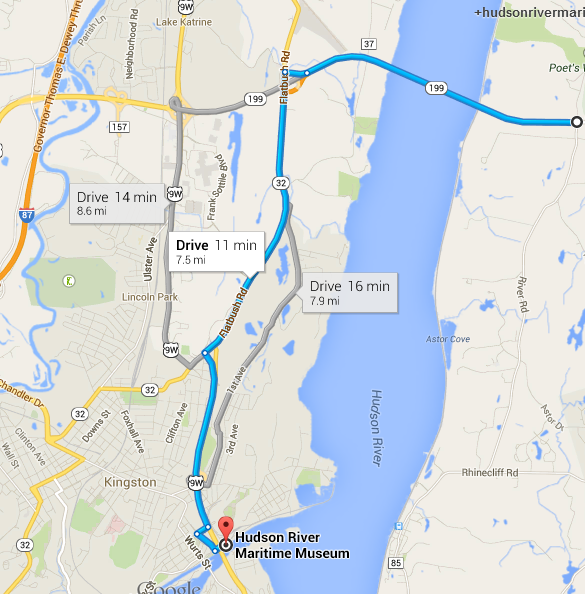 The Hudson River Maritime Museum is located on the Rondout Creek in the Rondout area of the city of Kingston, New York. Rondout was formerly a village separate from Kingston and the most important port between New York and Albany in the 19th century during the heyday of the Delaware & Hudson Canal from 1828 to 1898. Coal was brought to Rondout from Honesdale, Pennsylvania 108 miles over the D&H Canal. The coal was transferred at Island Dock on Rondout Creek into larger boats and towed down the Hudson to New York City and other ports. Coal was the fuel of choice in the steam era of the 19th century, powering everything from factories to steamboats. Many immigrants flooded into Rondout after the opening of the D. & H. Canal to work on the canal, the coal depot, the boats, and in supporting industries. The immigrants, mostly German and Irish, quickly set up a busy community with homes, churches, schools and businesses of many kinds. Among the supporting industries was the Cornell Steamboat Company, consisting of up to 62 tugboats at one time. This large fleet towed barges of coal and many other materials on the Hudson River to New York and other ports. Eventually Cornell had a virtual monopoly of towing on the Hudson River and employed hundreds of workers on their boats and in their workshops along the Rondout Creek. Hudson River passenger steamboats docked at Rondout and some, like the famous Mary Powell, the Queen of the Hudson, called Rondout their home. A ferry crossed the Rondout to Sleightsburg, and another left Rondout to cross the Hudson to Rhinecliff. Prosperity continued in the Rondout area through the 1920s, but began to decline in the Depression of the 1930s. Boatbuilding of naval vessels for World War II greatly revived the Rondout area in the 1940s as three shipyards operated with large work crews. The real decline set in during the 1950s with industries closing and businesses moving elsewhere. During the late 1960s the rundown waterfront area of Rondout was subject to the destruction of an Urban Renewal project leaving a mostly empty neighborhood. 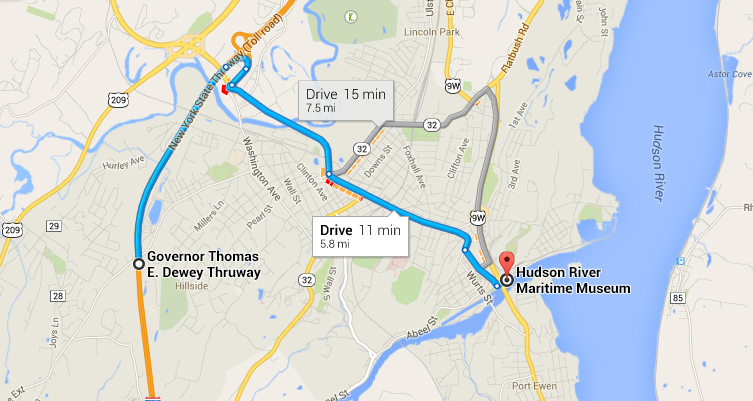 Around 1980 a renaissance began with new businesses, including the Hudson River Maritime Museum, coming to Rondout. Slowly new homes were built in historic style and the neighborhood revitalized. Today that renaissance continues and visitors, many on boats, come to enjoy the waterfront of our historic neighborhood. We hope you will enjoy your visit to our picturesque waterfront.